This boat was designed to be a fast cruising yacht which can be built at a reasonable price. 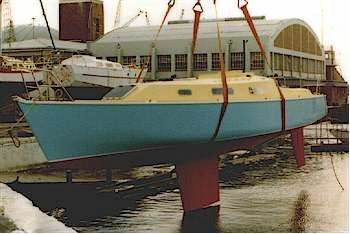 She can be built from plywood with a multi-chine hull with radiused topside chine or from cold moulded timber, GRP or sandwich GRP with a round bilge hull. She is very easily driven, with long waterline,narrow beam, shallow canoebody, fine bow and flat stern sections. Bow sections are well flared for dryness and reserve buoyancy while beam is carried well into the ends to enhance stability and offwind control. Despite being over 39 feet (or over 41 feet with the optional planing boards) and tiller steered, she is a delight to helm on all points of sail. Timber construction uses longitudinal framing over widely spaced bulkheads and frames to give an easily built and fair hull. Keel loads are carried by bulkheads and laminated floors. GRP one-off construction is with either C-Flex or "Airex" cored GRP, built over a male mould and using standard detailing for those methods of construction. The interior is laid out to be comfortable for a maximum of four for long passages or six for short cruises, without using the saloon settees as berths.All berths are 2m (6'7") long with the exception of the forward berths which are 2.2m (7'2"). The quarter berths can be built as two singles, two doubles or one of each. The saloon is traditional layout with opposing settees, folding table between and outboard stowage. Aft of that, the L-shape galley has plenty of stowage and work surfaces while the sit-down nav station is simple but practical. The large head compartment separates the saloon from the forecabin and has room for a comfortable shower. The engine is under the cockpit sole, along with fuel tankage of 150 litres (55 US gals). Water tankage of 300 litres (110 US gals) is under the settees. A masthead sloop sail plan of fairly modest proportions powers her, but she does not need a big rig. A removable inner forestay allows her to be sailed as a cutter for medium to heavy windward work or reaching in all strengths. The high placement of the inner forestay on the mast eliminates the need for runners and gives a more efficient double slot for most of the mast height. As a shorthanded cruiser, Coquette is a fast passagemaker and gives her crew exhilirating sailing. With her, the sailing is the fun part of cruising. 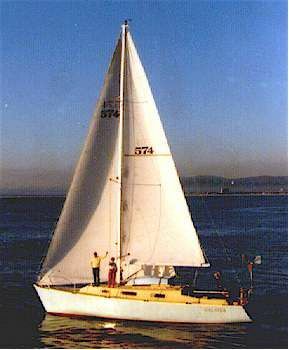 For a smaller boat of similar concept, see the CW975. Follow these links to the stability curve and the list of drawings for this design. Testimonial from Leigh Ross - Owner of COQUETTE 39 "Galatea", built in Cape Town but now based on Chesapeake Bay. "Had a lovely trip over. (Cape Town to St Helena Island) Best speed 17.6 knots, best run 215 miles, took just under 11 days. (to cover 1700 miles, the record then being 10 days) Fine cruising yacht, hand steering 6 hours straight no problem. Thanks for the nice boat."